A hand-rubbed, satin luster Cherry Bordeaux finish on cherry hardwoods and veneers. A flat top design features simple but elegant lines. The gloss white dial features raised black hour markers with a black minute track and hands. A polished chrome-finished bezel and polished chrome weight shells complement the dial. 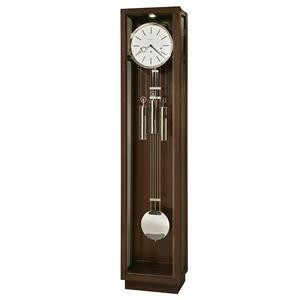 The polished chrome-finished grid pendulum adds to the linear appeal of the clock. The interior of the case is illuminated with an energy efficient LED lamp which is dimmable to three settings by touching the upper right door hinge. Beveled glass on the door, sides and side access panels. Optional polished chrome finished base plate is included. Cable-driven, Westminster chime Kieninger movement plays 1/4, 1/2, and 3/4 chimes accordingly with full chime and strike on the hour. Automatic nighttime chime shut-off option. Free Heirloom Record Certificate with nickel-finished capsule is included. Free nickel Heirloom Nameplate will be engraved with your name and special date. Four adjustable floor levelers provide stability on uneven and carpeted surfaces. 80" x 17.25" x 11.75"
Copyright Union Source. All rights reserved.